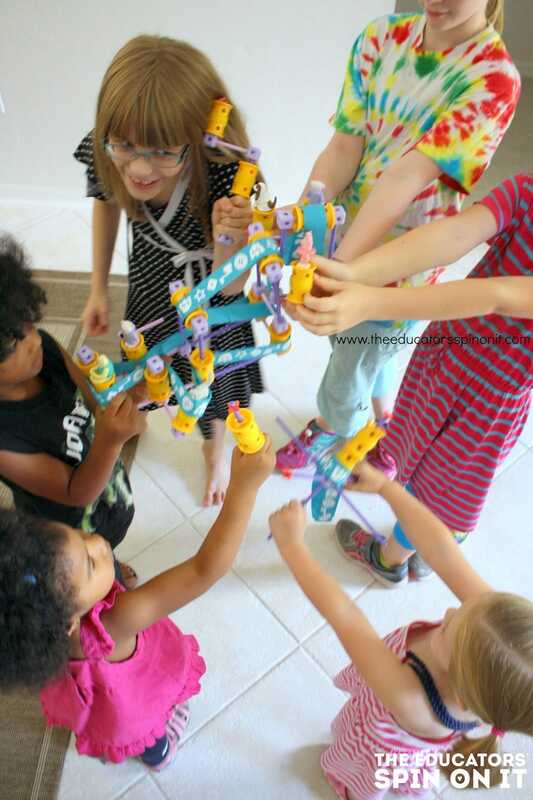 Goldie Blox Encourages Girls to Engineer – FUN STEM Activities!!! Getting kids (especially girls) excited about engineering through play is definitely a win in my book! We are a hands-on, minds-on kind of family. 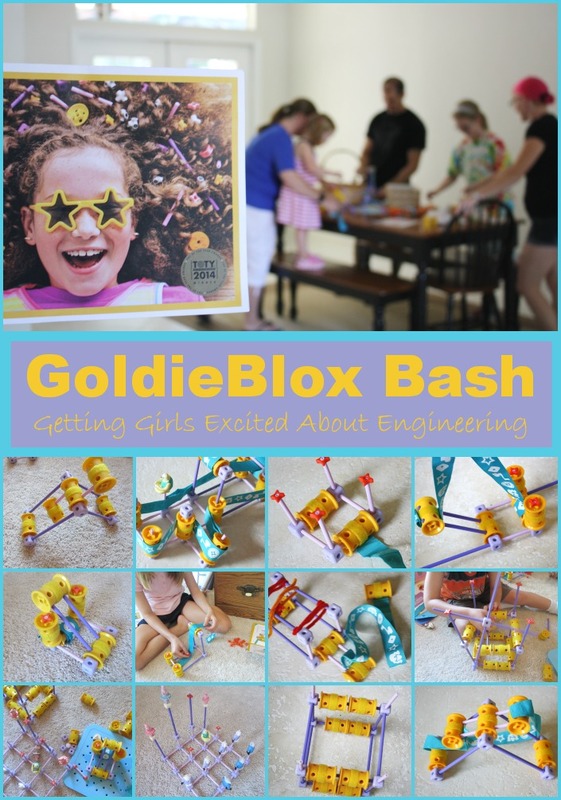 Just last week, we hosted a Goldie Blox Bash for friends to test out the building materials. Read on to find out more! What is YOUR favorite toy that encourages building??? My kids are big builders. We have many different sets and I would like to say that I encourage all of my 3 kids (boys and girls) to think like an engineer. My daughter even attended Camp Invention, an awesome week long invention camp that teaches STEM through modules. I WANT my kids to think like inventors too! Really, I just want my kids to think!!! 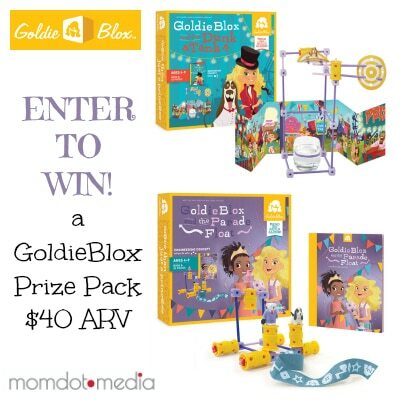 I was over the moon when accepted to review and host a Goldie Blox Bash with our friends, courtesy of MomDot Media. 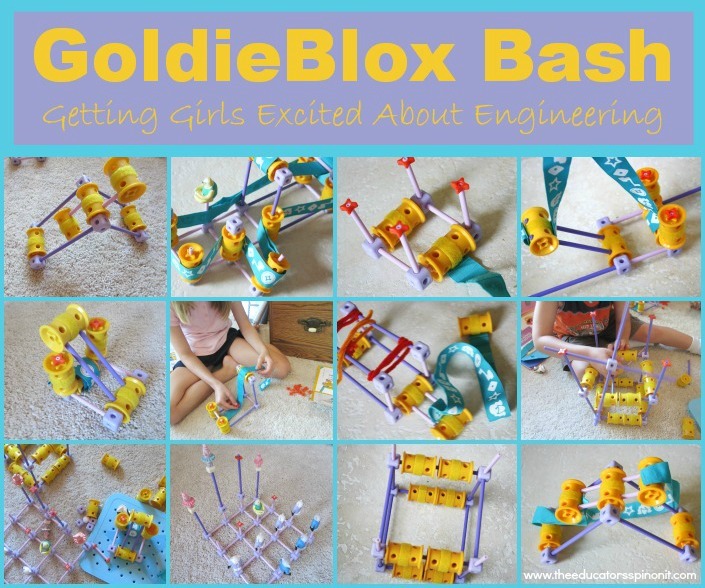 GoldieBlox is a was designed with the intent on encouraging girls to become involved in STEM activities from an early age – to fill the pink isle with construction and chemistry sets. It is a toy designed with my 8 year old daughter in mind. She LOVES princesses and dolls. I’ve never seen her in a pair of jeans – only dresses or skirts. She is a creative thinker who plays pretend will small dolls. Her favorite colors are purple and turquoise. She is also a scientific thinker, curious about the world. The minute we opened the box at the door – it was love at first sight. My kids got busy building and building and building some more!!!! In fact, in the 7 days before our GoldieBlox Bash, the kids spent at least 1 hour each day building, creating, designing, and inventing. 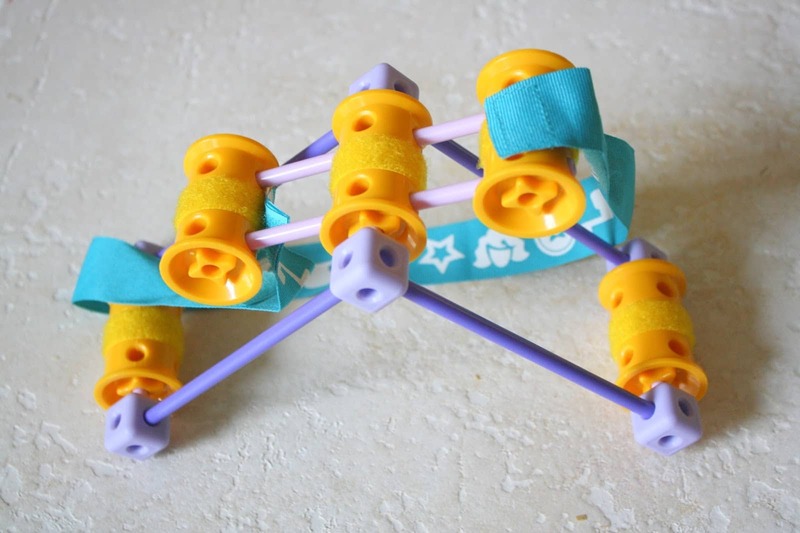 So what did our friends think of GoldiBlox? They thought the building materials were AWESOME! We had 12 kids and their parents over to test them out! The kids ranged in age from 2- 10 years old. There was one 2 year old, two 3 year olds, 2 four year olds, 2 five year olds, a six year old, a seven year old, 2 eight year olds, and a ten year old. What I was surprised is that ALL of the children played and interacted with the materials, building and designing. Some worked independently and other built with their parents. Dad (in the middle of building), nods his head in agreement. Other Dads chimed in that this a really neat toy for them to build with their little princesses. One friend (a 10 year old) said she was too big for little kid toys. We showed her the different designs at the back of the book and she stayed building the longest, making each project shown!!! The accompanying book didn’t receive as rave of reviews. Several of the girls read it and said, “way too girly.” They skipped to the back building diagrams. A couple parents commented that it was way too pageant oriented and princessy for their tastes. I giggled when one of the girls thought that the dolphin didn’t make a very good villain. “Everyone LOVES dolphins,” she commented. Other kids thought it was really cute. 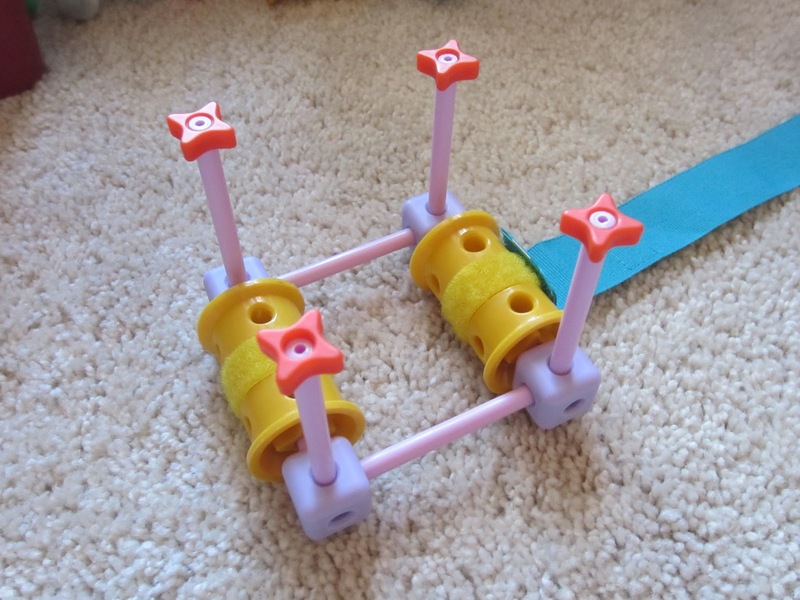 Would I recommend GoldieBlox toys to other parents? YES – Most Definitely! 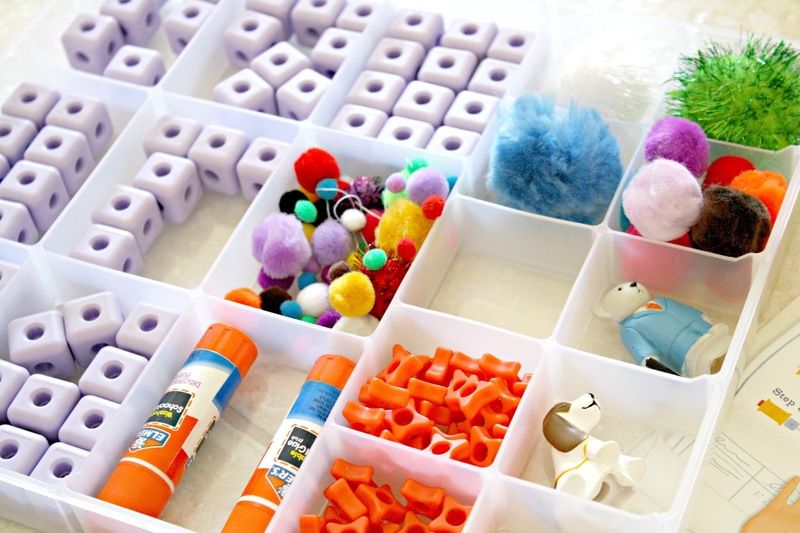 The kit is well thought out and provides for not only the building of the featured activity, but more independent play as well. The blox look very well made and should last for a while. It also was a good mix of colors that was visually appealing. Would you like to learn more about GoldieBlox? Follow along with the hashtag #unbloxing on your favorite social media to see more pictures of engineers discovering GoldieBlox and #LookatGoldie for more ways parents and teachers are using GoldieBlox with their children. Enter to WIN a prize pack that contains 2 GoldieBlox products, the Dunk Tank and the Parade Float, Giveaway open through September 30th! Stop back to see if YOU won!!! Can’t wait to see if you won? Buy your sets today! Both my kids would love these sets! They enjoy building all kinds of things and these sets would be a perfect addition to our homeschool classroom. Thanks for the chance to win! My kids would love building with these! These would be nice for my niece. My friend's 5 yr old daughter would have fun with these. This would be great for my constructing daughter! She loves to use anything and everything in our recycle bin to make constructions. We have the most unusual cardboard box pet apartments and jewelry all over our house! My daughters would love these sets. My grandbabies or my nieces would love to have these. My daughter would love these sets. 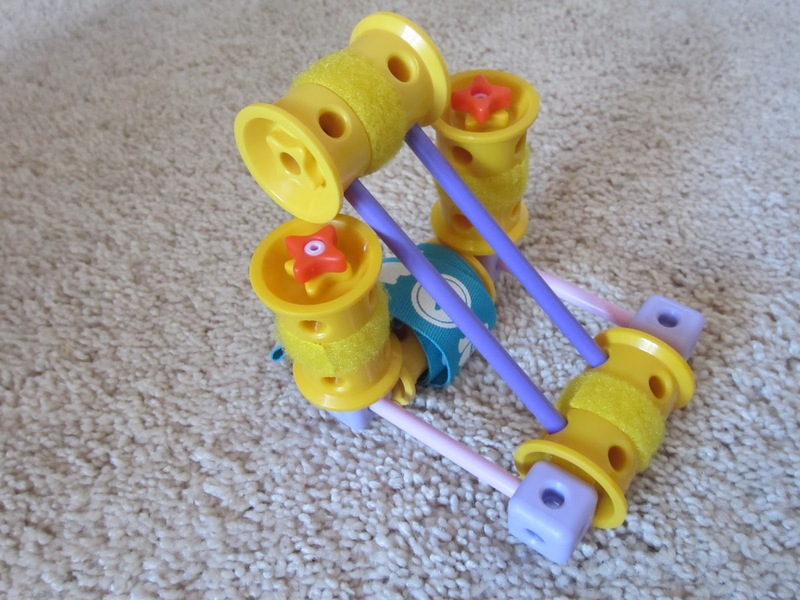 My daughter got the Spinning Machine set last Christmas and loves it. It would be awesome to have the 2 additional sets! My daughter would love this! Thanks for the opportunity! My Grand Kids and Myself would love to play with these sets.